Maintain women’s health, and protect a woman’s unique needs, with this herbal extract. 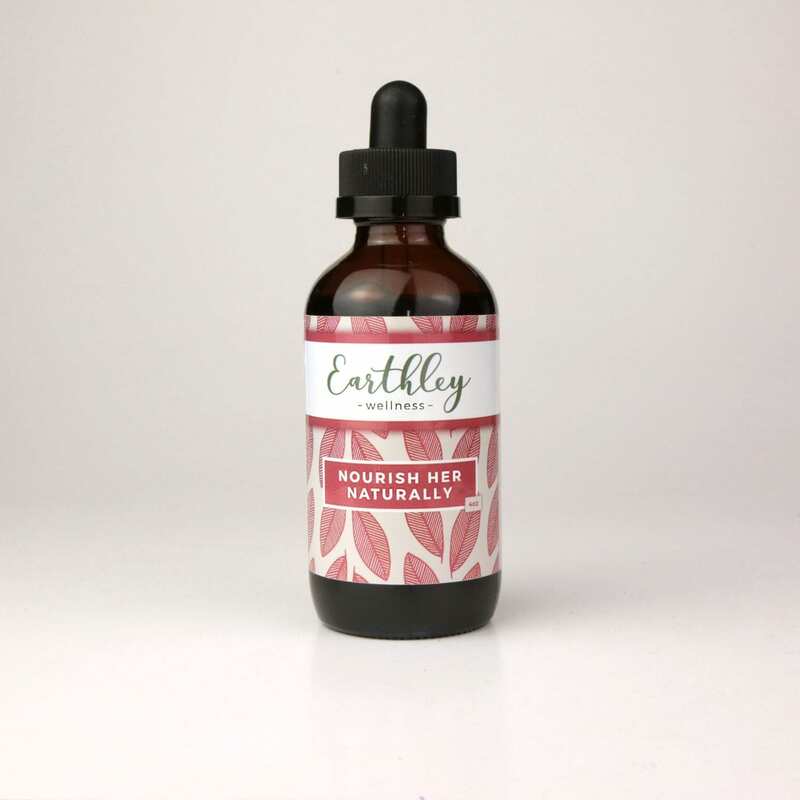 Contains red raspberry leaf and other herbs specially for women. Wish you had more energy, better hormone balance, or more nutrition in general? You might need a nourishing boost — with Nourish Her Naturally! Diets aren’t perfect, so many women consider taking a multivitamin. Most “multivitamins” are purified, extracted, and synthetic (often with additives). They also offer mega-doses of vitamins and minerals that are poorly absorbed and could throw off nutrient balance. There may not even be benefits to taking them. But not this one! Nourish Her Naturally is made simply, with whole, organic herbs extracted in palm-derived glycerin. Safe for pregnancy and breastfeeding moms. Some use it as a prenatal! Others just use it to keep their energy levels high and hormones balanced in all stages of life. It’s beneficial to young women and older women alike. Nourish Her Naturally is far beyond *just* a multivitamin. It’s a nutrient-dense herbal liquid that deeply and naturally nourishes your body. It’s vegan, gluten-free, and MTHFR-safe. Don’t mess with regular ol’ multivitamins any more. Stay naturally nourished! Worried that a non-standard supplement isn’t “enough?” Check out Does an Herbal Multivitamin Really Work? Organic nettle leaf, organic red raspberry leaf, organic dandelion leaf, organic catnip leaf, organic alfalfa leaf, organic spearmint leaf, palm-derived vegetable glycerin, filtered water. The mix also contains other trace minerals. It is high in water-soluble vitamins like B-complex and C. It is not very high in A, D, E, or K2 (because they are fat-soluble). Shelf Life: 1 year. Safe for all ages. Safe while pregnant and breastfeeding. This product and these statements have not been evaluated by the FDA, and it is not intended to diagnose, treat, or cure anything. This stuff tastes good! I’m not pregnant but am nursing my 2 youngest. I have Celiac disease so my body doesn’t absorb all the nutrients and vitamins in foods I eat, this tincture is a great way to get in what I need. I started out taking 3 teaspoons daily but was going through it pretty fast. I’ve gone down to 2 teaspoons to help make it last longer. I just received my NHN today and mixed it with water, expecting it to be unpleasant. Boy, was I wrong! It tastes like mint and honey and was actually enjoyable to take! Too soon to feel results but, I’m hopeful! I showed this to my midwife, and she was wildly impressed with this product. I’m happy to be able to continue taking this through pregnancy. I’m convinced that this tincture played a MAJOR role in my amazing pregnancy & labor. I had my baby at 42 weeks and his placenta was so healthy. My uterus worked amazingly from beginning to end. Bleeding was great and I love that this tincture supplied my baby with natural vitamin K while I was pregnant. Earthley doesn’t claim for this to do any of these things, but the ingredients are known to have these benefits and I really think it helped keep us very healthy. Love it!! Mmm! Something that tastes good and is good for you? Started taking this towards the end of my pregnancy and still do 4 months PP. nice to have something easy to take versus those huge prenatals that just don’t sit well with my stomach most days. This is baby #4 and best I’ve felt after pregnancy. Awesome! I feel 100% better everyday, and have tons of energy and joy for my family. What an amazing product!! I was spending roughly $120 on supplements per month to help with adrenal fatigue. I have been able to replace those for the most part with this. (I also use the magnesium lotion) it has helped me so much! I feel like my hormones have balanced and for the first time in years, I am actually able to sleep well at night. If you are not used to buyin high quality supplements than I can see how you may experience sticker shock at first, however I feel like I am getting a lot of bang for my buck compared to buying other individual supplements. Thank you! I don’t know if it’s coincidence or what, but I started taking this right as my cycle started. This cycle, compared to all the others was so much lighter and virtually crampless. It gives a nice boost of energy and tastes great! I’ll definitely be buying more. Love my NHN!!! Seriously, my nails and hair grow longer and faster since starting this daily tincture!! Also, if I’m in a rush I just drop some in my mouth on my way out the door unlike other tinctures where I need to add them to juice to get them down! Not bad at all!! Love the product can definitely tell a difference but maybe better quality lids on the 8 oz bottles. My daughter just got my brand new still sealed $35 bottle and dropped it on our floor and the seal came off and the lid broke off. Spilling a whole bottle all over the floor. $35 wasted. We’re sorry about the lid! Check your email for something from us. Great taste, clean product and safe for everyone. Really like it’s in a tincture and the kids like it. Cost is a little high but understand the process and time it takes to make it. Otherwise love it! This is my new favorite product. It tastes AMAZING! I love that I can take something that I know EXACTLY what’s in it. My LO loves it to and points to the cabinet every morning to take it. I received my bottle in the Feb package and will definitely be buying another one soon! Decided to take this instead of the prenatal after baby was born. I rebounded so much faster! It’s the best I’ve felt in a long while. Wish I had this for my previous pregnancy! Tastes great, too! I definitely recommend for feeling like your best version of you! This tastes good, and I think it has a good selection of herbs. I have the 8 oz bottle, and I take it the same way I do cod liver oil – I put the mouth of the bottle right on the edge of the spoon. This way, there are no dribbles. I am hoping this product will help balance my hormones. I bought nourish her naturally as part of a package to try out. First, I they didn’t taste bad at all. I actually really liked taking it. Second they are very reasonably priced for a high quality supplement!! I am taking this as my prenatal currently and this is my 3rd pregnancy (also using the magnesium lotion by Earthley) but my last 2 pregnancys I was completely exausted the whole time and had nausea all day. I feel my best this pregnancy and have energy and just don’t even feel pregnant!! This is the only difference I have done so I have to give this the credit for why I feel great! And it tastes good! Tastes like a more concentrated tea! Highly reccomend pregnant or not! Real whole food ingredients. Thanks Earthley! I love NHN!! It’s very sweet tasting compared to other tinctures that are rough to take! I only bought the 2oz bottle and I would take a full dropper in the morning and then another full dropper in the afternoon and I did notice I had more energy and just over all felt better than usual. I ran out within a little over week though so I didn’t get to experience the full benefits of this product but if I felt some benefits that quickly I can say with confidence if you take this every day and take 3 teaspoons you will feel great! I want to buy more and take it everyday but money is tight so can’t afford to at the moment but once I can I defiantly will! Great product! This is the perfect multivitamin! I didn’t notice that much of a difference when I was taking it regularly. When I noticed a difference is when I missed a day. My mood was awful. It’s hard to imagine that missing a dropper of this stuff made such a difference so I skipped it a couple weeks later and the same thing happened! I was so crabby and short tempered. I don’t miss a day now and my family really appreciates it. I got this as an alternative to taking multiple different vitamins, as I was looking for something natural. So far, I love it! I just wish it was slightly less expensive because it does go rather quickly. Tastes yummy, though…. pleasantly surprised about that! I use this as my daily multi vitamin and as far as i can tell its been great! Love the taste and the dropper with my last order. I’m committed to taking this everyday to see if it helps with my hormones as I go through menopause – so far so good! With my First pregnancy I took about 3 different pills a day trying to get all the vitamins I could to help nourish my growing baby. This pregnancy I was lucky enough to have found Nourish Her Naturally and I’m in love! It’s the only thing I take daily. I love that it has Red Rasberry Leaf Tea in it as that’s something I also added to my routine with my first and knew it helped out with my birthing process. My Midwife highly approves as well! I totally recommend this every woman! Part of my getting healthy plan. Take it everyday. Feeling good. I just started using this and I can’t wait to show my midwife! I’m so excited that it is a natural vitamin without all the extra stuff! It has a pleasant mint flavor but I still prefer to put it in juice. This has all the herbs I was using in my tea for pregnancy and breastfeeding so I was happy to cut out the time and effort of making tea. It tastes great, sweet and minty. Easy to use and no pills to swallow. I feel much better taking this and definitely see a difference in my overall mood and energy. My favorite women’s multi ever! I switched from whole food multivitamins to this and am never looking back. This has reduced my mom brain, gives me an energy boost, and it’s just what I need to fill in the gaps overall while I’m breastfeeding or pregnant (and in between too). I also love that it’s a liquid because it makes taking it with morning sickness a breeze! Super please with this product. I haven’t had this for very long so I can’t make any claims to balancing hormones but I will say it tastes delicious and it’s easy to take, I hate taking multivitamins because they make me feel weird and nauseous so this is a pleasant change. I have high hopes of it helping me with my hormones! I take this on faith, because I trust Earthly after having so much success with their other products. It’s definitely one of their more tasty supplements. I was already taking some natural vitamins, so I haven’t noticed much of a difference after switching to this one, aside from the cost savings, so I’m going to assume that means it’s doing a good job! Tastes good and I’ve never noticed such a huge difference in how I feel when taking a multi. I’ll never take another one! I love this stuff, especially while pregnant! I feel a lot better about taking this than prenatals. This tastes good and is easy to consume. Great way to tale my vitamins and helps me while nursing and currently being pregnant now too! This is the best tasting liquid multivitamin! A little minty, and lots of nourishment. Purchased this because all other OTC vitamins gave me heartburn and digestion issues. This does not do that. Very happy with it. I just ordered my second bottle. I love this stuff, I use it every morning by putting it in my Frappuccino. Makes my nails and hair grow fast. Love the benefits I get from them. Well worth trying! Love the spearmint-y taste! I feel like this tincture has helped boost and maintain my immune health while everyone around me has been sick. I bought this as a prenatal vitamin, but, honestly, I was kind of lazy about using it during my pregnancy. I had a weird issue with the taste because of being pregnant. However, I’ve been using it faithfully every day since delivery, and I like feeling that I am getting the nutritional support I need for breastfeeding. Also, I actually really like the taste now that I’m back to normal taste buds. I really like that it has nettle, which provides vitamin K since that is usually deficient in breast milk. As a side note, I had a problem with my original bottle (possibly due to heat exposure during shipment), and the customer service from Earthley was amazing: they sent me a brand new bottle at no charge. Anytime I am feeling a bit lightheaded, i take some of this and am feeling back to normal 🙂 I have never used tinctures before this one and was really impressed by the results! Can’t wait to get more! Tastes good. Love the herbs. Feeling much better since I started the tinctures. I love, love, love this and I take it daily! Since I’ve been taking it I’ve been super healthy and have felt great! It’s much better than any multi vitamin I’ve ever taken for sure! Love the taste too and I can take it straight. I’ve noticed results with this and use it daily now. My only complaint is that I just wish it lasted longer! I’m on my 3rd bottle. Fantastic product. This is honestly the best multivitamin I have ever used and I cannot imagine going back to another. The taste is amazing and it gives me an instant energy boost so I look forward to taking it. I also love the bioavailability. I really like this product. I was starting to feel really “off” on my OTC multivitamin and I feel so much better after switching to this multivitamin, and I really appreciate the additional hormone-balancing properties. Way to go, Nature! I love Nourish Her Naturally; I started taking it as a prenatal for my second pregnancy, as I had a terrible time keeping other prenatals down with my first pregnancy. NHN is easy to take, doesn’t taste bad, and I love the ingredients! I will continue taking this as a multivitamin after I give birth. I have to be totally honest here… I really wish this didn’t have mint in it. My supply is superrr sensitive, and I actually stopped taking this very early after my baby was born because I was seeing a dip. With the milk boost’s efficiency it might be ok. But I’m not really willing to risk it. This is great stuff, but I feel that supply-sensitive mothers could really benefit from a non mint, “nursing safe” version. I LOVE this stuff! The taste is so delicious and mildly sweet. I am so glad to have a source for vitamins that is easy to abosorb! I love this!! I use nourish her daily. It has made me feel so much better! I love having a liquid supplement made from real herbs. Not a factory created fake mass produced vitamin. This works!! I couldn’t live without it! By far my favorite product at Earthley. I use this as my multivitamin and will use it as a prenatal the next time I am pregnant. It has a mint flavor and I like to take it after eating breakfast straight in my mouth so that I get a breath freshener as well as a vitamin boost. I’ve been taking this daily for about a month now. I can’t say I feel noticeably different, but lots of great stuff in this one and has a good taste, too! I’ve been trying to get off pill supplements and use more tinctures, and this product is one way I am doing that. I am currently breastfeeding and I notice a difference when I take this product. And the taste is great! Reminds me of all the red raspberry leaf tea I drank while pregnant. I am enjoying this Nourish her Naturally! I have been having many hot flash episodes, feel like this has calmed them down. Easy to put in my water everyday. I will order more! I take this every morning! Tastes great and I feel like I have energy. It’s also nice to take a product that is breastfeeding friendly. Love the taste! An interesting product. It gives me energy when I take it in the morning and helps me sleep better when I take it at night. I’m hoping it will help regulate my menstrual cycle as I cruise into perimenopaise and beyond. I started using this when I was pregnant but had to stop because I had an awful aversion to mint when pregnant. I started taking it again postpartum and it’s a great multi vitamin! I take it in juice since the mint is quite strong. Since I am breastfeeding I take 1 tsp a day. I can tell a difference when I miss a day (which is rare). I’ve been taking this for over a year, for most of which I was pregnant and using Nourish Her for my prenatal. I was very impressed with the ingredients. My baby is now 6 months old and I believe this has helped in many ways. I had a very successful pregnancy, natural labor and exclusive breastfeeding experience so far. I continue to use this as my daily multivitamin. It tastes good enough to take by itself as well but I wish I could up my dosage without going through it quickly. That being said, I think it’s a product that will remain in my daily regimen. I know this product has greatly helped me with energy hormones during pregnancy, postpartum and breastfeeding now for a year. I have had no problems with breastfeeding this round- i did with my first child, and know a few of these ingredients support it also. I like having a mult vitamin that i feel like i am using and absorbing a lot better. It tastes great and I will continue to have this in my regimen for a long time. Another great Earthley product! If I could give it more than five stars, I would. This is one of the few vitamins that does not upset my body. It’s gentle and I can control the amount taken. I feel so much better when I take Nourish Her Naturally. Thank you for making a gentle vitamin with no ethly-methyl-bad-stuff fillers. I have been taking this product for about a month. I can’t say I notice a huge difference in how I feel, but I know there’s good stuff for us gals in that little bottle 🙂 The taste is great! I started taking nourish her naturally as a prenatal supplement. I love the taste (I had a hard time taking and swallowing prenatal pills so this was an awesome alternative!). I love that it is plant based and avoids synthetic vitamins. I plan to continue to use this throughout the rest of my pregnancy and also as a breastfeeding supplement. I love that this is in liquid form since i’m terrible at taking pills and can’t choke down those huge horse pills either. It’s easy to take along with my other tinctures in the morning. I love the taste and love that it is plant-based and not synthetic.